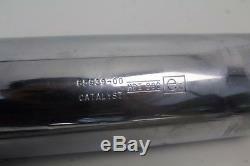 Harley davidson softail fatboy flstf exhaust exhaust muffler part. This product page has been automatically translated. If you have any questions, do not hesitate to contact us. 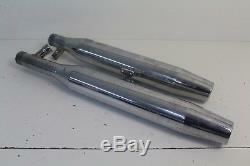 Exhaust muffler harley davidson softail flstf fatboy exhaust kit set 2000 2003. For all your motorcycle needs. Large inventory of used motorcycle parts in stock. Motorcycle Parts> harley davidson> softail. Your browser does not support the video tag. Object / item muffler exhaust kit / muffler set h-d no. Additional images are greater than the description of the article where the possible damage can be seen pronounced what is seen in the picture. Please see the additional pictures above the description of the article on which possible damages are presented delivery what is shown on the pictures. Browse all used motorcycle parts that are not described further, are technically and visually good condition, except for the usual signs of age-related wear and the type of spare parts. Everyone's real damage is described and explained. All our motorcycle parts used without further description of the condition are in a good technical and optical condition, with the exception of the usual user marks that was caused by age or use. All actual damage will be described and with additional photos (below) presented. Attention / important: we describe the model, condition and type of motorcycle parts with the most attention. If you are not with the party are satisfied or when it does not fit, you can always turn to us, we always find a solution in good vote. We would be delighted if the buyer give us the opportunity to solve the problems rather than general neutral or negative note or a small detail to be seen again. We describe the model, condition and type of motorcycle parts with the most attention. If you are not satified with the party or the party does not fit, you can always contact us and we always find a solution in close consultation. We appreciate when buyers give us the opportunity to solve problems instead of receiving neutral or negative feedback or a negative general feedback detail. Shipping every Tuesday and Friday after receiving the payment by DHL or NL post depends on the destination. Shipping with track & trace. Transport every Tuesday and Friday after receipt of payment with DHL direct or post nl, depending on destination. Delivery always with track & trace. We send per week every Tuesday and Friday upon receipt of payment. We use dhl and tnt, depending on the size, weight and destination of the package. We ship only easy to follow shipments with track & trace number. The transit time depends on the destination and the distributor. We do not deliver cod. We do not charge a packing fee. You can cancel your contract within 14 days without giving reasons in writing (letter ec, email). The period begins after receipt of this form written notice, but not before the receipt of the goods. You will have to pay the return fees in the following cases. If the delivered goods are described or. 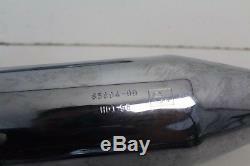 If the price of the item to be returned does not exceed 40. Otherwise, the return for you to be free, but only after obtaining our consent. Bond to reim stock market payments must be made within 30 days. The item "harley davidson fatboy softboy flstf exhaust exhaust muffler part" is on sale since Monday, September 11, 2017. 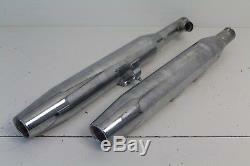 It is in the category "auto, motorcycle parts, accessories \ motorcycle \ spare parts \ exhaust systems \ silencer , deflectors ". The seller is "motorparts4ucom" and is located in 's-hertogenbosch. This item can be delivered anywhere in the world.